Historians have rarely recorded the true importance of the Texas Navy in the winning of the Texas Revolution against the Mexican dictator. But without the efficient and effective work of the Texas Navy in preventing the landing of Mexican troops and supplies at Texas costal cities during the campaign, the victory would probably have not been won, or at least would have been greatly postponed. 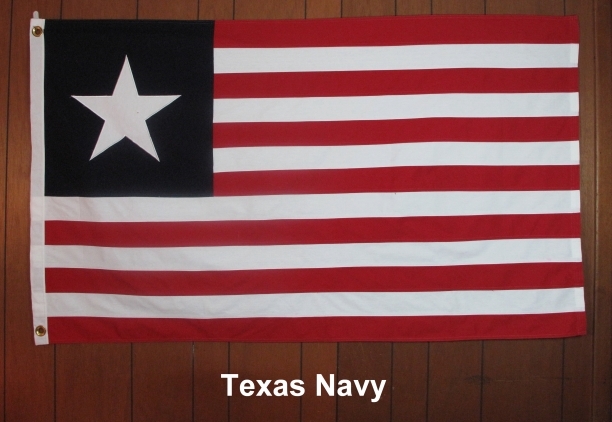 On April 9, 1836, President David G. Burnett authorized the flag designed by Commodore Hawkins as the Texas Naval Flag. Its field of thirteen alternate red and while stripes was a reproduction of the flag off the United States except that its union of blue bore only one large, white five-pointed star in the center. Its similarity to the United States flag often confused the Mexican warships and when they saw it waving in the breeze, they hurried away without giving battle. The first of these flags was made by the ladies of Harrisburg. As cloth was not plentiful in those days, it is said that one of the ladies ripped up her red flannel petticoat, which was used to supply material for the seven red stripes of the flag. Later, the Second Texas Navy, under command of Commodore Edwin Moore, added glory to the history of the Navy of the Republic of Texas. 3'X5' cotton, cut & sewn. Satifaction guaranteed. 100 percent refundable for 10 days upon receipt.